The lack of a significant atmosphere, and hence very little greenhouse warming, combined with Mars’ distance from the Sun, make Mars a very cold place indeed. The only significant weather phenomena on Mars are dust storms and strong winds. These dust storms can obscure the sun for very long periods of time, sometimes exceeding several weeks. Will there be enough natural sunlight on Mars to grow crops such as tomatoes, if they are housed in a suitable greenhouse, or will artificially heated greenhouses be required? The two images below illustrate the solar spectrum as seen from the Earth and Mars respectively. Above the Earth’s atmosphere the solar irradiance is slightly more than 1300 W/m2 (1300 watts per square metre). The Earth’s atmosphere is not perfectly transparent to sunlight and about one quarter of the Sun’s light is absorbed or scattered before it reaches the surface. At the Earth’s surface, with the Sun directly overhead at local noon (clear dry atmosphere), the solar irradiance is reduced to about 1000 W/m2 (1000 watts per square metre). This value is highly variable depending upon such things as the amount of dust and water vapor in the atmosphere. At local noon on Mars, with Sun directly overhead, the solar irradiance is 590W/m2 (590 watts per square metre). All the above measurements are taken with the incident light perpendicular to the absorbing surface. If the sunlight falls on the surface at an angle, less energy will be incident (per square metre) on the surface. The shapes of the spectra are identical. They only differ in their height. 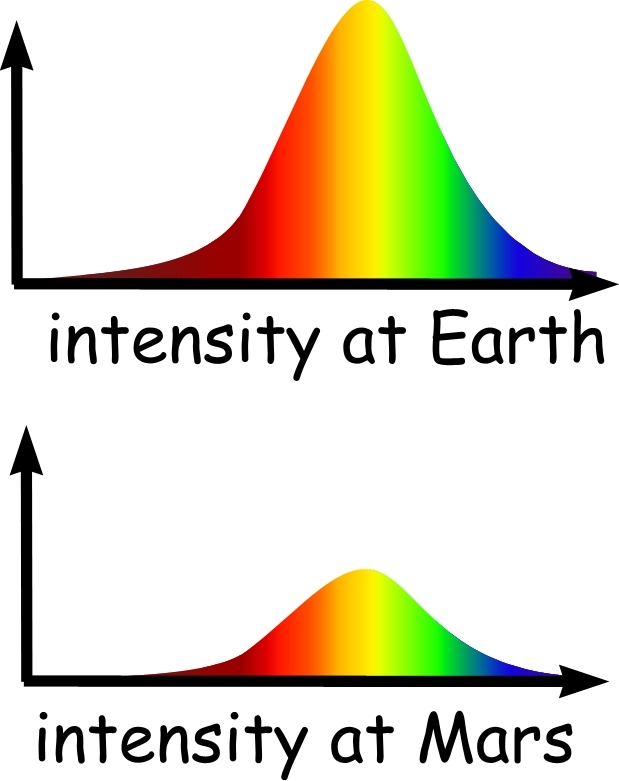 The total area of each spectrum is proportional to the total energy of the sunlight. In other words, the area of the images is proportional to the irradiance. The maximum solar irradiance on Mars is about 590 W/m2 compared to about 1000 W/m2 at the Earth’s surface. The Sun’s intensity on a horizontal patch of the Earth’s surface of 590W/m2 occurs when the Sun is a mere 36 degrees above the horizon. For example, the maximum intensity of the Sun, to local noon on Mars, with the Sun directly overhead, is approximately the same intensity as the Sun on Earth at noon on February 15 in Minneapolis, MN or Portland, Oregon. 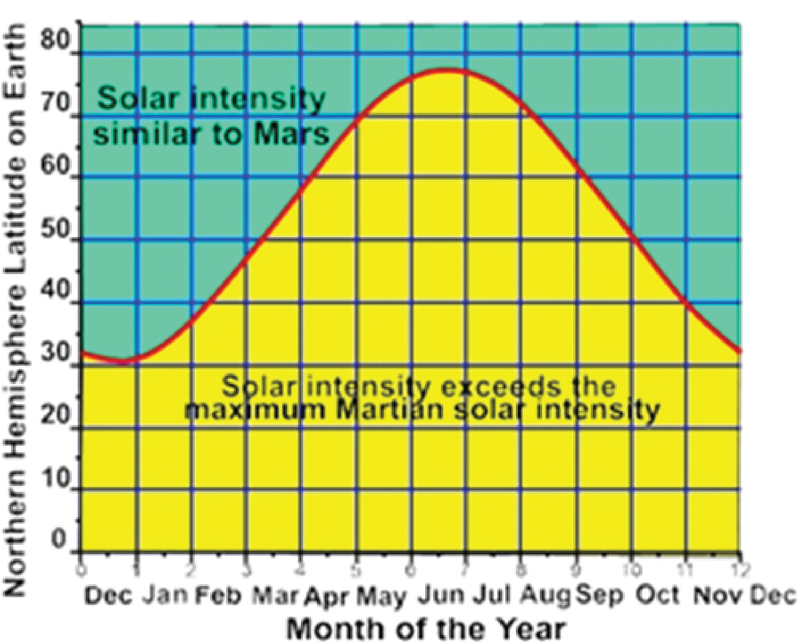 The chart above compares the intensity of the Sun on Mars to the intensity of the Sun at your location on Earth, using the date and latitude of specific locations. For any latitude and any date you can determine if the intensity of sunlight on Earth is less than, or greater than, the intensity of the sunlight on Mars. In the dark shaded area (blue-green) the solar irradiance on Earth never exceeds 590 W/m2 (the maximum solar irradiance on Mars). In the light shaded area (yellow ) the solar irradiance on Earth exceeds 590 W/m2 for at least part of the day. On the red line between the two shaded areas the intensity of the sunlight on Earth reaches exactly 590 W/m2 for just a few moments (at local noon). You can verify this fact by locating the solar conditions on Earth, at 75°N on the chart above. 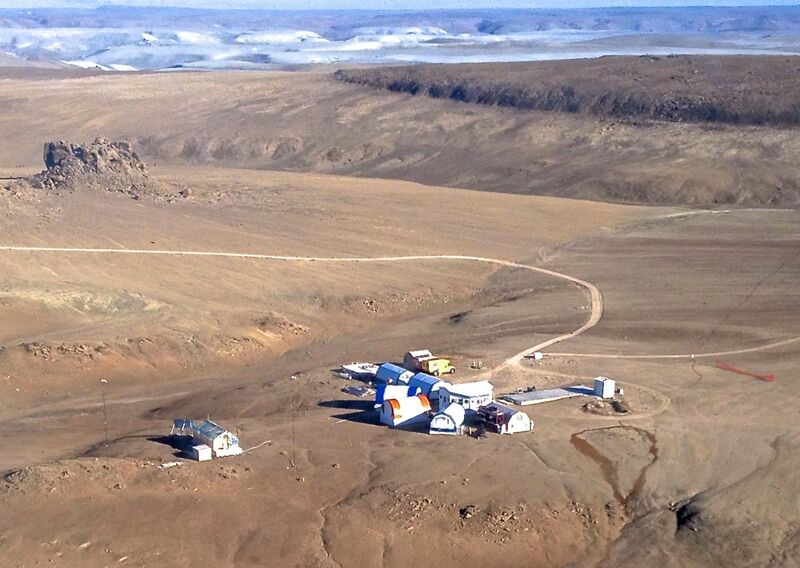 Will there be enough sunlight to grow tomatoes outside on Devon Island? 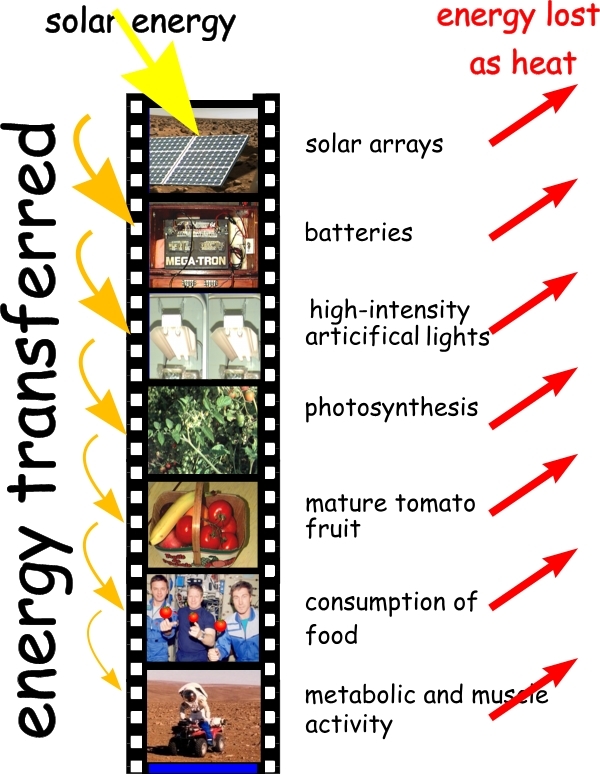 Will tomatoes grow inside a greenhouse on Devon Island or will solar energy need to be collected, stored in batteries, and then “concentrated” using artificial heat and light? 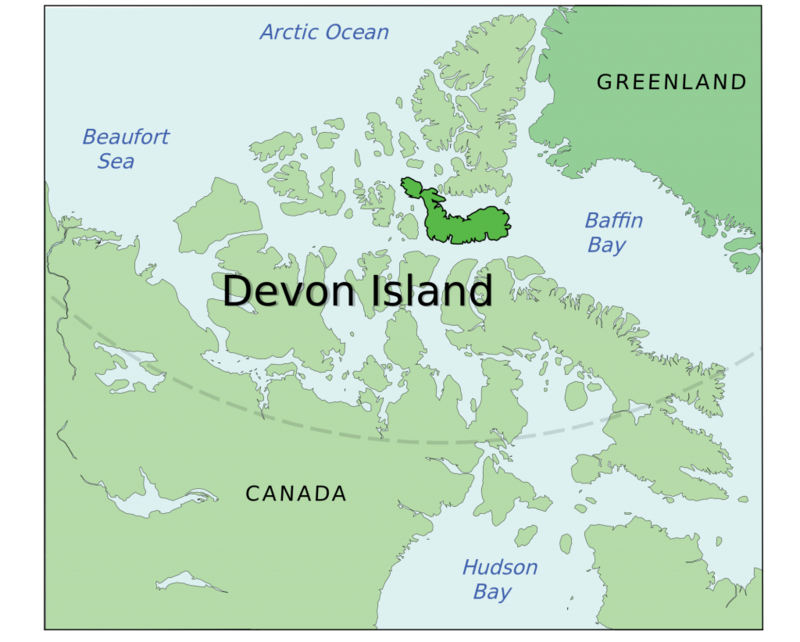 Although the light intensity (near local noon only) on Devon Island is similar to that expected on the Martian Equator, the duration of daylight during this time is 24 hours per day because of its high latitude (above the Arctic Circle). On Mars, near the equator, the duration of daylight is about 12 hours, followed by approximately 12 hours of darkness. A Martian greenhouse will need to be well insulated to avoid huge temperature drops at night. Perhaps a combination of passive greenhouse heating during the day, supplemented by electrical heating and lighting at night will be required to provide a suitable growing environment for plants to be grown on Mars. Collecting and storing solar energy is an extremely inefficient process. 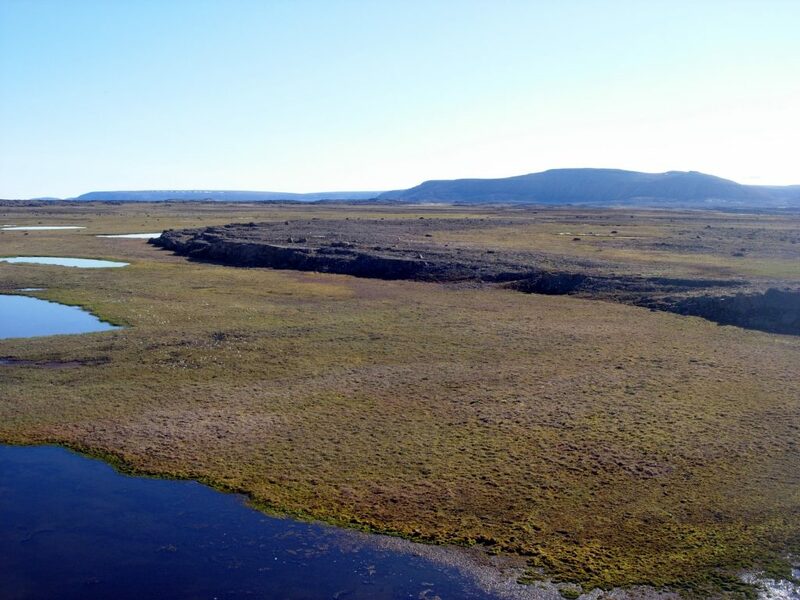 A major fraction of the energy is lost as heat long before it is made available as light energy for plant growth.